I’ve been rather silent this week as we are currently in the middle of renovating the barn we are moving into. We only have 4 weeks to finish it so it’s been rather hectic! At the moment it’s seems miles off being finished but I’m assured it will be ready on time! All our spare time has been spent painting, sanding and doing general donkey work to speed the job up. I wouldn’t mind moving into a house that wasn’t finished a few years ago, but now we have Will I am much more anxious that things are finished. Busy baby who is furniture cruising and into everything plus building site- no thank you! In fact, the whole moving with a baby scenario is bonkers. Filling one box takes hours as Will likes to play boo/needs a feed/doesn’t want to pack! Every night I look at the house and wonder what I can actually pack- babies need a lot of things every day, it’s all going to have to be packed at the last minute. I certainly haven’t stopped cooking though! If anything I’m cooking more as I find it a brilliant way to relax. I have made this particular recipe for years and years, but have avoided sharing it for one reason and one reason alone – the spelling of the word ‘houmous’! There are SO many versions out there and I simply wasn’t sure what to write. Then I made it the other day and Will was such a huge fan of it that I decided to bite the bullet, choose a spelling and share the recipe. Houmous features in our weekly meals quite often, I find it handy to keep in the fridge to add to sandwiches, salads or as an impromptu snack. I’ve said it before and I’ll say it again, but having healthy snacks to hand really ensures I make better food decisions (most of the time – sometimes I still decide that a ginormous bar of cadburys whole nut is completely necessary)! While there is very little wrong with some shop bought versions, homemade really does taste better. 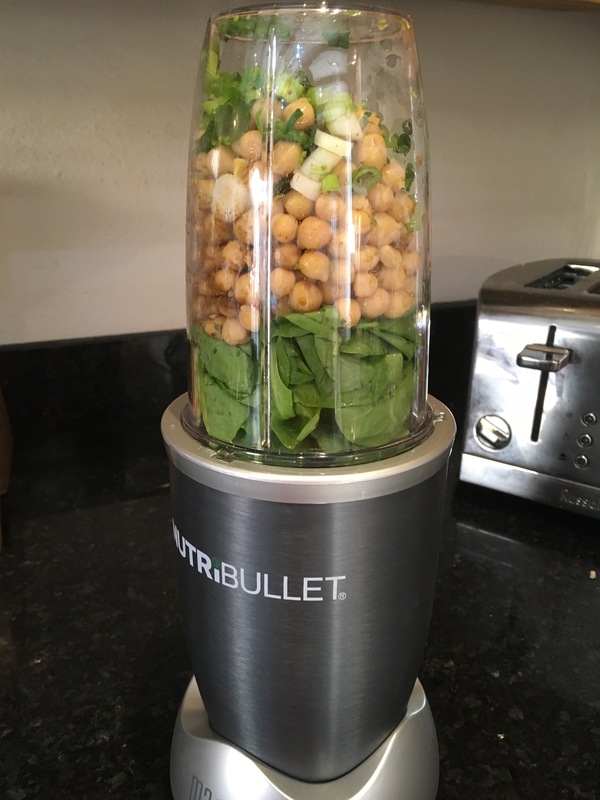 I use my nutribullet to blitz the ingredients making it both quick and low on washing up (vital in my kitchen). It can also be made from mostly store cupboard ingredients. Houmous is also an excellent food for babies and children. 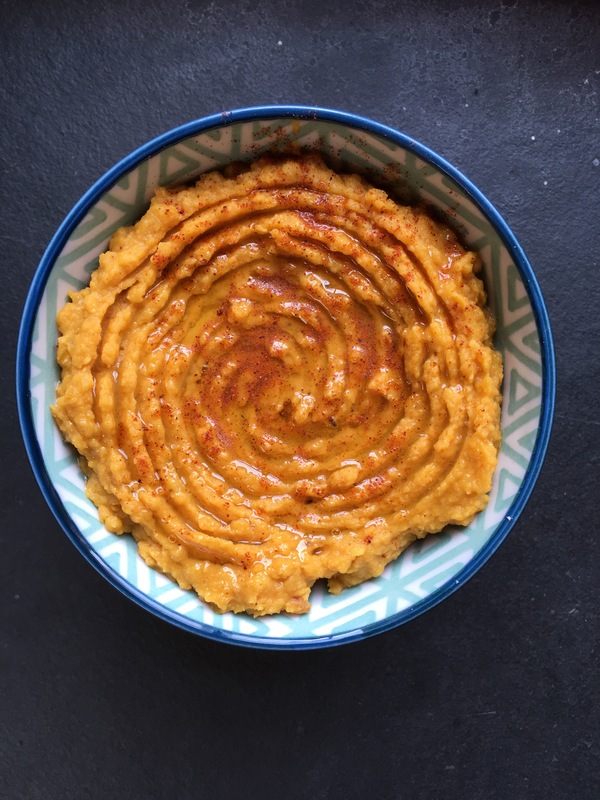 This version is full of protein and fibre from the chickpeas, and the butternut squash adds a lovely sweetness that children love. They can scoop it with their favourite vegis or breadsticks and it’s completely free of salt, stabilisers, preservatives or other unnecessary ingredients the shop bought offerings include. I have substituted the squash for carrots or sweet potato in the past, but the squash is my favourite. Drain the chickpeas and add them to blender with the lemon juice, tahini and olive oil. To serve I like to drizzle it with some more olive oil and some smoked paprika. This is perfect with crudités or breadsticks as well as being great in wraps or as an accompaniment to a salad. It keeps in the fridge for 3 days if covered, although it’s normally eaten before this in our house! Well, that was my little break, now it’s time to choose bathroom tiles! Its nearly the end of June, it’s raining, its foggy and we all have colds. All in all its a grumpy house this week. Will is frustrated if we stay in all day but gets too tired and overwhelmed if we are out for too long, which is making it hard to know what to do with him! This morning we went to a soft play centre which he enjoyed for about half a hour before turning back into to a little cuddly, grizzly boy. I’m not complaining though, having a cold is horrid and he is never normally cuddly so in some ways it’s nice (for me). His body is obviously fighting hard to get him better as he is also napping a lot! He has currently been asleep for over an hour which is unheard of in the afternoon for him! As I wrote that previous sentence he woke up, when will I ever learn!? DON’T MENTION GOOD NAPS! Anyway, my point was that both the weather and everyone being under the weather, meant comfort food was definitely in order for supper! Comfort food for me is bowl food – the kind of thing you can eat with just a fork. 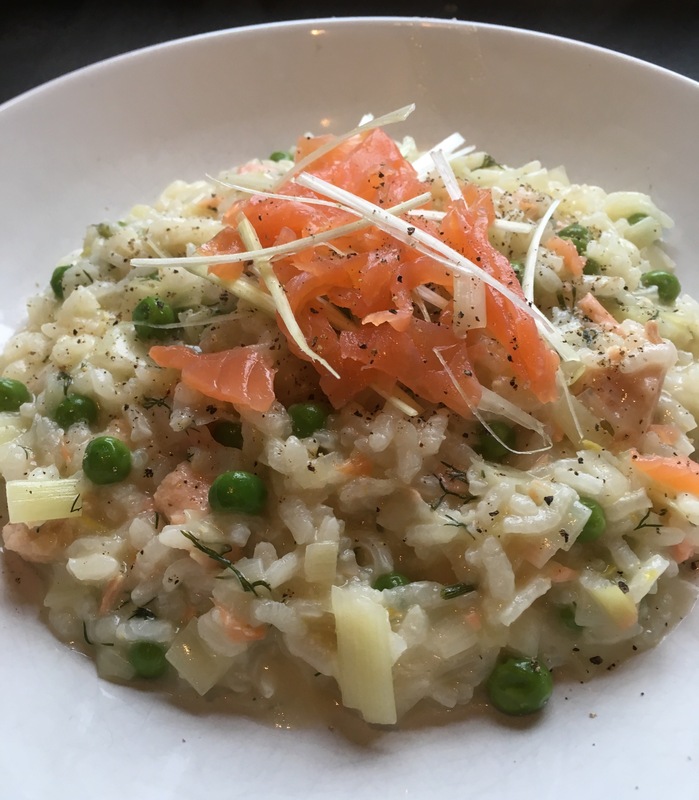 Risotto is perfect comfort food, and this salmon and leek version manages to feel both warm and cosy, as well as light and summery. It’s not hard to make either, but as with all risotto it does take some serene stirring. To make it baby friendly there are a few sacrifices compromises. They aren’t actually sacrifices, as it’s delicious and full-flavoured without them. There is no white wine added, although the lightness of the salmon and leek come through more as a result. It really isn’t missed in this particular recipe. There is also a lack of salt so it can feel under seasoned, but I have a trick for this which will become clear in the recipe method! This is enough for 2 adults and 1 baby portion. Keep adding more stock as the rice absorbs whats in the pan, stirring periodically to prevent it sticking. I like to use a wooden fork for stirring as it prevents the rice from breaking down. Once the rice is cooked and the liquid absorbed (20-30 minutes), turn the heat off, add the remaining butter, the dill and roughly two thirds of the smoked salmon, and stir to combine. For the adult portions, I add the rest of the smoked salmon on top, with some of the green leek and a generous crack of black pepper. Adding the rest of the smoked salmon to the adult portions ensures that the baby portion isn’t too salty, and the adult portions’ become adequately seasoned. I like to add the raw leek as it provides a fresh taste as well as a contrasting texture from the smooth creaminess of the risotto. Risotto is excellent baby food as it is so versatile: you can feed it in a variety of ways. For baby led weaning you could simply squash the peas and pop this, once cooled a little on a plate/highchair tray (messy but effective). You can also wait for the risotto to cool, mash the peas and roll it into balls the size of a walnut. These can be coated in parmesan and bread crumbs and lightly fried to create finger food. Finally you can pop it all in a blender and puree to you required consistency. This is what I have done today as when Will isn’t well he prefers to be fed by me. What are your favourite comfort foods? I’d love to know! I’m writing this at the beach whilst Will has a snooze in his Pram. I have days when I curse that we live in the countryside middle of nowhere. These are usually days when we have run out of chocolate, I can’t find anything to wear in our small selection of clothes shops, or I’m desperate for chain restaurant food (normally Wagamams). I have infinitely more however, when I am so grateful that we live in such a beautiful place. We are so lucky to have the beach on our doorstep and maternity leave has really made me appreciate it. Maternity leave has also enabled me to enjoy lunchtimes with my husband and Will. This glorious weather has meant we have been eating lots of salads; not so good for a 6-toothed, 10 month old baby. So today I made some falafel for us all to share. We had ours with salad and Will had his with some chopped crudités. 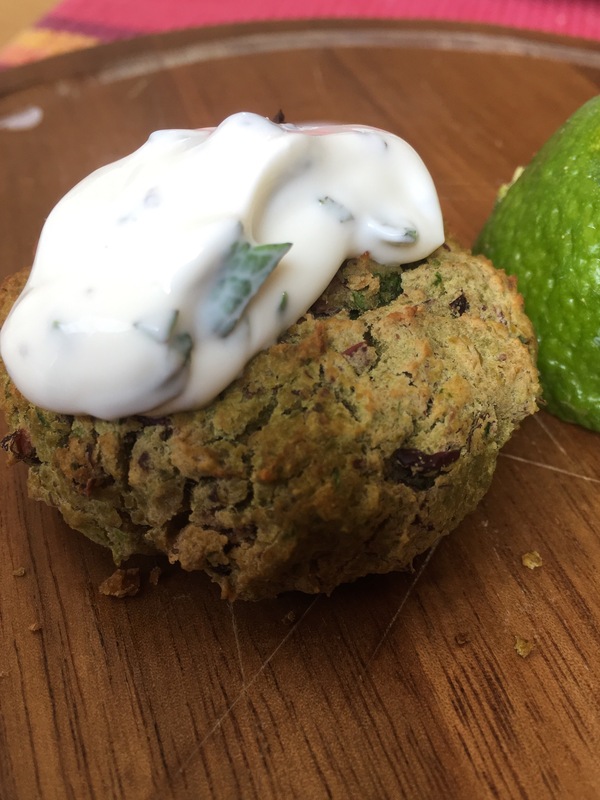 The reason I’ve called them superfood falafel is that I increased their vegetable and nutrient content by incorporating raw spinach into the mixture. I also used both chickpeas and kidney beans to expand our culinary net just a little further! This serves 2 adults and one greedy baby with a couple left to freeze. You could add fresh herbs such as coriander, I haven’t because my husband hates it! Either mash using a potato masher, or if a finer texture is required blend using a blender. I blend mine in the nutribullet to make sure it’s soft enough for Will to eat. When they have cooled drizzle over a little olive oil and bake in a pre heated oven at 180c for 30 minutes. To go with these I made a mint and cucumber yoghurt dip. Falafel can be dry but the spinach and egg in these really prevent that being a problem; the yoghurt is still a delicious accompaniment though. They are lovely in flat breads or tortilla wraps and keep well in the fridge; perfect for packed lunches. These can also be frozen once cooked, just thaw them and then reheat in the oven. I hope that everyone is able to enjoy this warm weather we are having. For now, I’m off to get another glass of iced water!